Incase you didn't know by now, I love to side hustle. I even started this blog so I could share all my crazy experiences with side hustles so I could pay off my credit card debt. I also regularly update this side hustle blog post so I can share new side hustle ideas with you all the time. This way there is something for everyone! Side hustles are great because there are so many different layers. You might want to side hustle and earn an extra $50 a month. Or, maybe you want to make an extra $1,000 or more per month. Either way, you have come to the right place! By definition, a side hustle is not the same thing as a part time job. It's a side job that you do in your spare time to earn income. I've compiled an epic list of side hustles ideas for you to try. 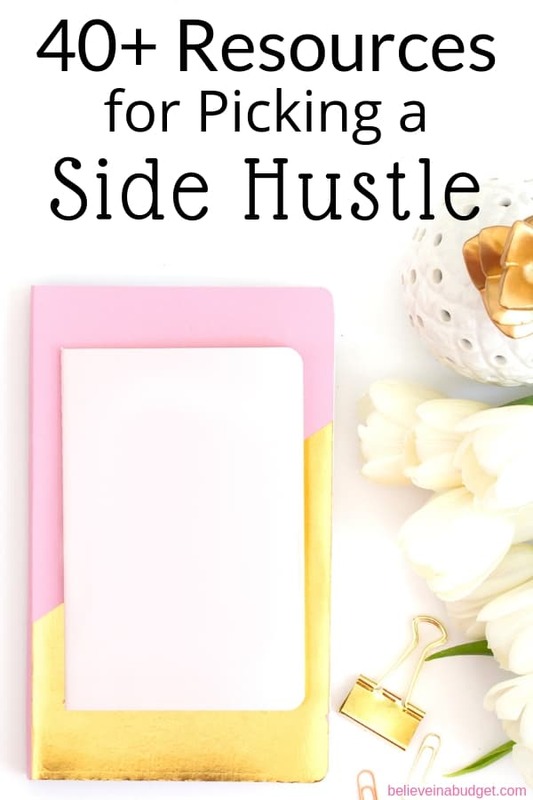 I have done the majority of side hustles on this list, so I can speak from first hand experience that this side hustle list is legit. I started this blog in January 2015. It took roughly four months of blogging in my spare time to make my first $40! Next, grab these free blogging guides! I always recommend starting a blog as a way to make money, and these workbooks and guides are great for reference! Blogging has totally changed my life. I was able to quit my day job and become a full time blogger in only ten months. My blog started as a side hustle and now it is part of my overall business model. I even share my online income reports so other people can see how I got started and know that anything is possible. As you can see, I did not get rich overnight. But I stuck with it, and my income started growing very quickly. There is no way I could have ever made this kind of income at my day job! My online income now comes from my blog, and includes things like affiliate marketing, ads on my website, my products and courses, freelancing and coaching. Think about turning your hobby or something you excel at into a service that helps others. This could be creating stock photos, writing newsletters, researching articles – there is a ton of things out there that people need help with. If you cook, make meals for someone who is short on time. Provide cleaning services, run errands for someone or help someone get organized. People are super busy and often times will pay for help if it makes their lives easier. If you are interested in learning how to become a Pinterest VA, this course can help you get started with your own freelance business quickly. My favorite part about Ibotta is that it’s not always brand specific, like a lot of coupons are. So you’ll be able to scan “any brand of bread” for 50 cents off, etc. If you do coupon – you can STILL use Ibotta and get a rebate. For the diehard couponers out there, this will often result in getting an item for FREE. When you sign up for free, you will receive a $10 cash bonus when you make your first scan! Over the past couple of years, I have stayed at several AirBnB's and saved a ton of money. I've been able to rent an entire house, condo and apartment instead of a room at a hotel. This has been a great to explore and live like a local, bring my dogs and simply have more space. Have you ever thought about renting out your home for a weekend? Here's more information on how to become an AirBnB host. Tip – Staying in an AirBnb can be so much more fun than a traditional hotel. You can learn more about how to use AirBnB here. Using the link, you will also get a coupon for $40 off your first stay anywhere! This is a really great side hustle that can be pretty consistent. I used to dog walk for 30 minutes and charged $20 per walk. Most of my clients needed me 3-4 times a week and this was regular income. This was a great side hustle job at the time as I was working from home and could really commit to this. Rover is a great resource if you would like to walk dogs or pet sit. This is a booming side hustle and perfect if you love animals! Pay varies, but I would make anywhere between $20 – $60 per day, but it really depends how much time you invest in this side hustle. Learn more here. After you make a purchase, you earn a percentage of the sale! They literally give you cash back on every purchase you make. The cash back ranges from 1% to 14%. The money is then deposited into your PayPal account. I created the Pinterest Presence course for fellow bloggers and businesses. My monthly page views skyrocketed from 1,000 to 160,000 in under a year, which was crazy. So many people asked me how I did it, so I created Pinterest Presence to help other people. If you have a skill that could help others, why not create a course? You can start with a free course or charge for your course. Think of what type of skill set you have that can benefit other people. Craft tutorials such as knitting, how to use a CriCut machine, calligraphy and more! Learn more about the Teachable platform if you would like to create a course to help other people. Every couple years, I help similar companies in my field of work (outside of blogging) with updating their records, renewing certifications with the state and filing paperwork. Each job ranged between 10-15 hours and paid around $300. If you want to work online, you should consider becoming a virtual assistant. You can work from home, at a coffee shop and even on vacation. You can also learn more about virtual assistant skills here. If you love writing, then you should consider becoming a virtual assistant writer. If you love Pinterest, become a Pinterest virtual assistant. Work your own schedule and make mad cash! I know plenty of drivers that work all kinds of different time shifts, whether it's working during rush hour, happy hour or in the evenings. Since I take Uber all the time, I've met some amazing people. Many drive with Uber full time and many drive part time to work around their regular work schedule. Awesome! To learn how to become an Uber driver, click here. The app determines the going rate for the area and all payment is processed online, so no need to exchange cash with your customer. Enter code 03F89 and test out the app – you'll receive a FREE $50 credit and be ready to apply as a service-provider. The Second Hand Millionaires are the champs of going to auctions, purchasing items at a great price and then flipping them. They are sharing all their secrets, hints and tips here. Sometimes the best way to sell something is to get out in your community. This works great if you are selling something perishable, a craft you have made, etc. This is a great way to make extra income, test your products and get feedback. This post will teach you how I got started, what all goes into becoming a vendor and how I became the farmer's market manager (which was a paid part time job!). If you aren't sure how to even get started on how to sell and ship things on Ebay, this tutorial will walk you through everything you need to know. This is a classic side hustle and still lucrative. Jayleen from Sunshine and Rainy Days breaks down all the tools and methods she uses to sell on Ebay. This is such a great way to make money and can turn into passive income. Anyone can write a book and self publish it on Amazon. As an example, I'm in a book written about 17 bloggers who make six figures per year. My friend and best selling author Sally wrote the book! My friend Angela J. Ford is an amazing author (fantasy and sci-fi) and publishes her books on Amazon! When my MacBook broke beyond repair, I placed an ad on Craigslist to see if anyone wanted a broken Mac. A bidding war broke out! I kept the hard drive, and then scrapped the parts for around $350. Not bad! If you have any old laptops, computers, phones, etc. wipe them clean and consider selling them for parts. I had no idea this was such a lucrative business until the guy I sold my laptop told me how much parts go for online. I have completed a few of these taste tests and wish I could complete more! I have paid to sit for an hour and taste various food products and provide my opinion. I completed a 2 hour panel study on coffee and was paid $150. Mystery shopping is becoming more and more popular as there are a ton of websites you can sign up with. I have completed shops that include trips to the aquarium, sporting events, Walt Disney World, theme parks, fancy restaurants, casual restaurants and department stores. I recommend Side Hustle to Success if you love any of the places I mentioned above. Yes, I have been paid to sniff things and give my opinion. I have sniffed dryer sheets, soap and dish detergent. If you like talking to people and are outgoing, this would be the perfect side hustle. You get to set up at different venues and pass out free samples. My Debt Epiphany shares how she side hustled by passing out free booze. This is not for the faint of heart. I tried this a couple times and it was too much for me. Unfortunately, I fainted after donating and that was the end of that side hustle! However, most people are fine and donate on a regular basis. Yup, did this. I worked at a private pharmacy, helped package it and then delivered it. It was pretty crazy and you can learn more about it here. This study was done through a local college. I found the ad posted online through the university’s local newspaper/website. Students receive grants to test theories/studies and use the grant money to pay for their research, which includes paying others for their time. I was paid $50 for 90 minutes of my time. One year I wasn’t able to go home over the holidays so I sought out a part time holiday job. Because I worked a full time, Monday to Friday job, I opted for 1-2 evening shifts and 1 weekend day. This amounted to 12-16 hours a week and between $140-$190 a week before taxes. Another bonus was the company discount, which was a 35% discount for seasonal employees. I even stayed on with the company after the holidays for a few months as I enjoyed working with my fellow employees and genuinely liked the company I worked for. Do you really need to keep all your textbooks from college? Get rid of them on Amazon. Selling your college textbooks back to your school is one of the worst ways to make money and very rarely pay well. When I went to see how much the school was offering to buy it back, I was offered ZERO dollars because the school wasn’t sure it would be using the textbook again. So I sold the book online and it sold for roughly $250. Sell (or buy) your school textbook here. When I moved, I got rid of a ton of stuff on Craigslist and through Facebook groups. Since my goal was to become more of a minimalist, and I just had stuff laying around, I decided to try my luck. I have sold everything from patio furniture to books to leftover pavers from a home improvement project. My biggest tips would be to provide a full description with lots of pictures. I personally love Etsy. I used to have my own shop and made a nice part time income over the course of two years. You can sell pretty much anything on Etsy, whether it's crafting, edibles or even things like tutorials! I've purchased Christmas card templates, cat toys, beer kits, cheese kits and a ton of other stuff on Etsy. If you can imagine it, you can sell it on Etsy. Zazzle lets you create and design all your own products, and then sell them on your website or Zazzle's website! You earn a commission of each sale and set your own rates. Nikki from MBASAHM wrote an amazing post about how these odd items make her big profits! This is most profitable in August, September and beginning of October. If you wear a costume once, keep the packaging. You can resell a gently used costume, often at a great price. I have also sold dog costumes my dogs have worn. My dogs wore their costumes for a couple hours on Halloween, but that’s it! I have the photos and memories and don’t need to keep every costume or outfit they wear. People will often pay almost full retail for dog costumes, and I have easily made back the money I initially spent! This is a great way to accomplish a couple things- improve your health and get compensated for it! I participated in a particular study that compensated me $100 for each return visit and this study lasted several months. It eventually rolled over into a similar study and I was compensated a similar amount. You can read about my adventure here. I accepted a 3 month contract position on top of my regular, full time job. The contract position was similar to my full time job title but gave me the opportunity to branch out to a slightly different line of work that I hadn’t done before. This position turned into 6 months and there were numerous benefits to accepting the contract. While the pay rate was just good, not great, I was able to work from home, learn a new niche in my field of work, make new contacts and update my resume! If you have time, why not see what else is available in your career niche? This was a referral through a customer and I got paid hourly to organize and clean a master closet. This took an afternoon and I made about $100. This side hustles relates to my day job. A couple of businesses reached out to me to see if I could help with some organizational paperwork. I helped these small businesses with renewing business licenses, reviewing CEU classes, resale certificates, etc. This was an easy job for me, I enjoyed it and completely worthwhile. As you start trying out these epic side hustles, don't forget to try to save money! Start saving, even if it’s only a few dollars a week. Digit lets you save money each week from your checking account. What I really like about Digit is that it analyzes my bank account and determines how much I can really save per week. Some weeks it might be $5 and other times it might be $20. You don’t have to worry about overdraft and can contribute less or more if you need to. 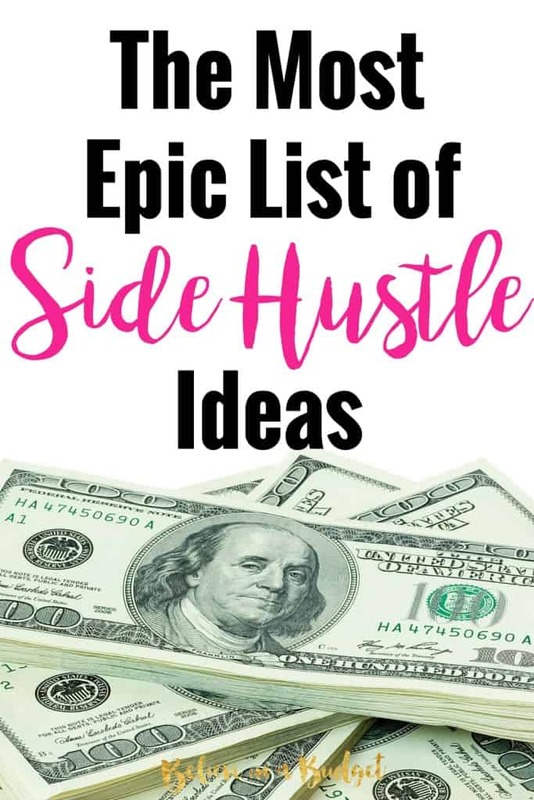 So there you have it – my epic list of side hustle ideas. It's crazy to think I have tried about 95% of these. Hopefully you can find a side hustle that works for you. Have you tried any of these epic side hustles on this list? Previous Post: « Elite Blog Academy Review Is it Worth it? I love this! I’ve always had side hustles (eBay when it first started), temp typist, tutor (I hated going to people’s home – so I only did that one a couple of years), substitute teacher, clean out garages and then sell the stuff at flea markets. Right now, my favorite side hustle is selling lesson plans online (very lucrative). I love side hustles – thanks for this great post! For three years, while my son was napping I would enter sweepstakes and contests. I didn’t have consistent wins every single month, but I had some amazing prizes over that time, including a $10,000 win from Philips, $5000 from Sears and $500 from J.C. Penny and many more. Many prizes would arrive unannounced so opening a parcel was always a fun event in our household. Strangest prize was a box of pork rinds! How in the world does one get into tasting alcohol? I need an in on that one! Great side hustle ideas . . . I have been searching for some great ones, and here I saw ones I haven’t seen anywhere. I guess I’ve done side hustles my whole life, just didn’t know thats what it’s called~! -Taste tested different brands of bologna…I ate so much, i now won’t go near it! -Gave plasma. I too passed out! -Painted logos on air balloons. -Alterations. Bride gowns in particular. -Craft shows. I made money for my kids to have a great Christmas. -selling on Craigslist. Never had a problem with creeps but was cautious non the less. -Painted and sold landscapes on mirror tiles in a couple of malls while customers watched. Wow, I’m sure I’ve done more and they will probably come to me throughout the day. I currently sell on Etsy for 6 1/2 years now. Awesome! Side hustling is the best. The air balloon side hustle sounds really neat! !